The last time I made sugar cookies I was a teenager in high school. It was one of those free recipe cards I picked up at the grocery store featuring loads of name brand shortening. It’s no wonder I lost interest in this cookie for so many years. Besides, sugar cookies seem so plain. I am easily distracted by chocolate, nuts, dried fruit, and lately whole grains. I had little incentive to revisit this classic until this week when I saw a new contest hosted by America’s Test Kitchen Feed. The premise for Cooking With The Cast is simple. A feature recipe is selected by a cast member who fills the readers in with his/her tips and tricks. All I need to do is to cook the recipe and submit a photo of my dish. The cast member gets to pick a favourite to be the winning entry. That was how I came to bake my first batch of sugar cookies in over twenty years. 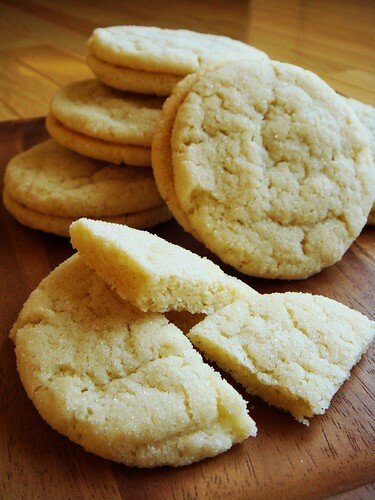 Test Kitchen’s Chewy Sugar Cookies truly delivers on its promise of crispy edge and chewy centre. The recipe and tips are easy to follow and practically held my hand in every step telling me what to expect. I’m no stranger to baking cookies and the only slightly challenging part is to handle the very soft dough as little as possible. It wasn’t difficult to follow the recipe exactly as written with predictably delicious cookies emerging from my oven. Every cookie was perfectly round with artful crackle and sugary coating. Melted butter, cream cheese, and grapeseed oil join forces to create this distinctively chewy texture and incomparably rich flavour. Of course I cannot resist the temptation to leave them alone. I stared at my batch of cookies on the cooling rack and before I knew what happened, I matched them in pairs by size and shape. Only a couple of days ago I tested a sandwich cookie recipe and it did not work as well as I hoped with cookies that should best described as polygons. My thoughts were preoccupied by sandwich cookies redemption. I wanted an easy filling that is still mostly homemade so I went to my larder to grab a jar of Bing cherry jam that I made a few weeks ago. I like my jam with a looser consistency so I knew it is not ideal as filling. 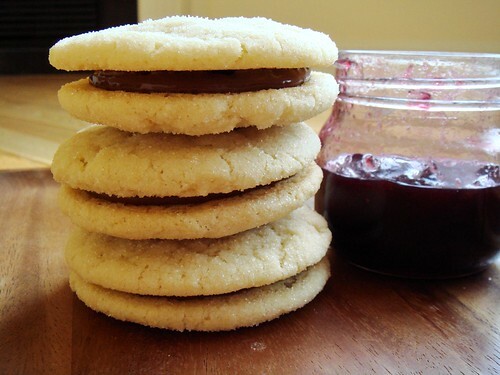 How do I prevent the jam from squishing out between the two cookies? The solution is simple and delicious. All it needed was a barrier made of Nutella! 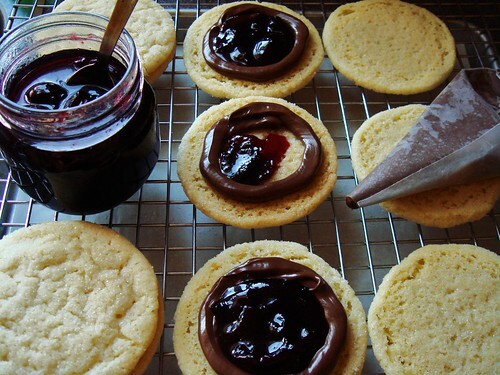 The thick chocolate hazelnut spread conveniently contained the jam and double-duty as an adhesive. Besides, the combination of chocolate and cherry evoke memories of black forest cake. Can you say decadent? 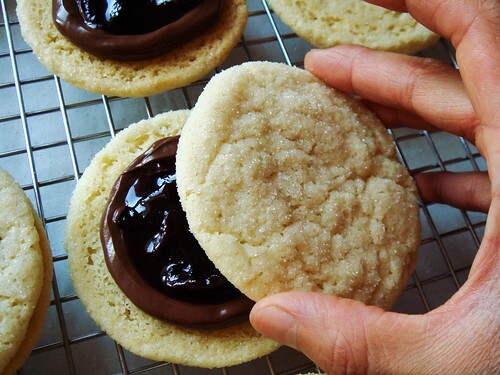 These Chewy Sugar Cookies with Black Forest Filling are best enjoyed shortly after you filled them. They are on the sweet side so a cup of strong black coffee is a good pairing. If you want to make them ahead, it is best that you keep the components separate and fill the cookies just before serving. Thank you America’s Test Kitchen for reintroducing me to sugar cookies and inspiring me to create a rich treat! Edit August 5, 2011: The results are in! No win this time but considering how much Boyfriend and I enjoy these cookies, it's already a win-win in my books. You can now call me "Miss Person I Want To Marry".